I picked up Rajdeep Sardesai’s book because I was curious, and reading it in-turn piqued my curiosity about the back-story of the Nehru-Gandhi family and the growth of the Congress in India. And so I picked Durbar. I’m racing through it and was going to share my thoughts on both in a single post, but couldn’t wait given this mornings twist in the election tale. I’ve seen reports in three Hindi newspapers, and it seems to be scattered over the net, but has totally escaped mainstream English news in this country. Not shocking at all. It’s little events like this that illustrate just how manipulative the powers that be, can truly be. It becomes important to know and to acknowledge that most things in the news are a version of the truth, closer to fiction than truth itself. And that there is little that can be trusted, as far as political propaganda goes. For those of us who have a very different idea of good days, it becomes even more important to know that perhaps, all is not lost. I picked it up after I watched this interview based on the number of times he said it provides a “ringside view” into the run up to the election that just passed. And that is what it is. I’m not a deeply political person. I am aware, keep myself abreast with current events and developments, know what I value as a citizen in this country, what my priorities are, and every election I have voted in has been about choosing the lesser evil. Ours wasn’t a family that openly discussed politics, and unlike many friends who tell me their entire family backs one political party or the other, I don’t remember that being very apparent for me, while growing up. I’ve also never been very keen or inclined to understand the deeper layers of our political history, until very recently, when it has become living room discussion that is hard to get around. My stand this time around has been much more deeply thought out, strong and well formed. Given that background, this book made a good read because it goes back to landmark events from a couple of decades ago, drawing neat plot lines on how things have been steered for both the BJP and Congress, dispelling a lot of my doubts and confusion about picking sides (and my inability to pick either). It was informative, insightful and opened my eyes to many facts and implications. I understand history better when it is presented in a linear fashion, and this book did that for me. – the colossal amounts of money spent on campaigning. I was aware they were obscene, but didn’t in my wildest dreams they would be to the tune of hundreds of crores. If our political parties could only siphon of some of that to regenerate villages, feed hungry children and do even an iota of the number of things they pontificate about, I can’t imagine the development we’d begin to see. The numbers were too huge for me to even wrap my head around them, and the mind really boggles at the fact that we could find no better use for that volume of funds. Worse still, that a lot of this is public information and cannot be questioned or challenged. – the open disdain for the media. Considering it is the media’s job to hold a mirror up to the times we live in, I’m more than horrified at how uncomfortable the truth makes our politicians. – The book trashes both sides equally, painting a fairly honest and disturbing picture of the horrors that both major political parties have perpetrated. Going back to every major event over the last 20 years that has shaped the personalities of the Congress and the BJP. 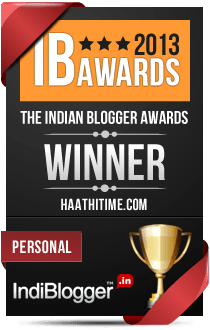 – By the end I began to see some semblance of why there is this impenetrable aura around Modi, and why we oscillate between pity and hatred towards Rahul Gandhi. It made me incredibly sad to have the facts laid out rather logically, to realise that we are a truly bankrupt country, when it comes to leaders, statesmen or people of character and substance. Given the kind of gems of people our independence movement unearthed, I’m beginning to wonder if it is only that scale of suffering and that intense a fight to reclaim what should be rightfully ours, that will bring to the fore leaders of some calibre. In telling the pitiful Rahul Gandhi story, The Election That Changed India goes pretty deep into the history of the politics of the Congress as a party. I was born in 1984, and the first Prime Minister I was old enough to register and know about was Rajiv Gandhi. I was 8 when he was assassinated. So I was extremely intrigued by some of the anecdotes in Rajdeep’s book, and curious to know more about what made him enter politics, what are the workings of a political family, why were the men all so reluctant, and what must it be like to be a part of a family that has been put on a pedestal for a greater part of our years as an independent country — to be given a status they don’t deserve, and then eventually to have it all come crashing down. I remembered Durbar, and bought it almost instantly after I finished The Election. I’m half-way through and I might have to come back and edit my views on this once I’m done but here’s what I found so far. It begins in a slow and whiny manner, putting Tavleen Singh’s own angst about her fall out with the Gandhis too much in the fore. I wonder if the entire book is in itself an outpouring of this pent up anger at being rejected. It does however shed light on the details of the Emergency, and the horrors of 1984, previously unknown to me. Considering I will probably never pick up anything academic on the matter, I think these two books have been a good way to get to know many details and developments in the six decades of our history that has shaped the times I live in. Especially considering the persistent strains of deep frustration that are constantly bubbling under, with regard to the general direction in which we are moving as a nation. At this point, anything that will help make sense of much of the insanity that our leaders are unleashing on us, is welcome. I don’t know. I see the value in what you are saying-that it’s better to know and to be depressed-but is it really? For me personally if I listen to too much bad news I get desensitized and I would rather get upset about something I haven control over than get depressed over something I can do nothing about.about the politicians, I think that’s a lament made by everyone, in every country-their politicians are corrupt and self-serving-it is true for Indiabut not necessarily unique to India. You’re absolutely right about the general lament by everybody, in any country, when it comes to politics. The nature of the game is to veer into areas of injustice, inequality and exploitation, to one party or another. But I was talking about me, personally, I feel totally washed over by the general sense of doom that one encounters in conversations in the real world, and online. This is probably the lowest political low I think I have encountered in as long a times as I have been old enough to understand the basic working of politics in India. And that has never been a very in-depth understanding. I was talking specifically about me, in saying that having read these books I feel like my opinions are now based more in reality and my understanding, rather than just the general vibe and hearsay. This is interesting. I refrained from sharing that NavBharat Times link on twitter and fb for this reason. News takes on a very different colour when it gets rapidlyshared. Perceptions and opinions colour andtaint facts very easily and cloud perspective. Thanks for sharing this. Knowing their histories, I believe Durbar is probably a terribly biased view of the things and the people she writes about, entertaining though it might be. Since you appear to be interested how the Indian polity came to be, I would highly recommend India After Gandhi by Ramachandra Guha. Very interestingly written, not a boring narrative, and by an eminent historian who has sought, despite himself, to give out a balanced story. Youre absolutely right. I am more than half way thru now and I want to just get to the end, because as much as I have enjoyed the political landscape that has been painted, the bias is very obvious. Im attributing this towards Singh’s own personal fall out with the Gandhi’s and maybe the book is written to make her peace with some of it? I dont know, Im speculating. And believe it or not, INdia after Gandhi is next on my list. Have bookmarked an excerpt some time ago and revisited it today and decided I’ll buy it once Durbar is done. I think theyre both good books if you take them for what they are. Im finding Durbar a bit whiney and biased, but it is also obvious that Singh’s personal issues with the Gandhis is coming out thru the narrative, so as long as you’re aware of that perspective its a good read. Doesnt change the facts presented in the book. This – I feel it is important to know and be depressed, rather than wallow in a perfunctory cynicism like one tends to given the wave of love and hate (depending on which side you’re on) that sweeps most forms of media that I consume. For this reason, I will buy this book. Thanks, Re. Yes, which is why I ploughed through even though parts of it were really depressing. Because theres a lot of in depth politicking that a) i didnt know about and b) that can only be told in narratives like this. It will never make the mainstream news, I think. IT put this election in perspective. I do believe that the modi wave has come for a reason, much as I dont want to accept it, I think it is here to stay and live out its time. This is part of a cycle we have brought upon ourselves.